This is certainly a wine with a pretty high reputation and one that many people who drink fine wine will be familiar with. Cakebread Cellars has had plenty of success throughout the years and I believe it's mainly because their wines are pretty damn consistent and maintain a high qualitative standard. 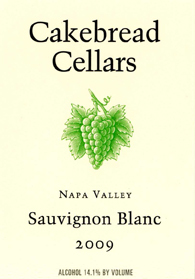 The 2009 Cakebread Sauvignon Blanc was sourced from several vineyards throughout the Napa Valley, but the majority of the wine is composed of fruit grown on their estate vineyards in Rutherford, Calistoga and Carneros. The wine is 91% Sauvignon Blanc, 5% Semillon, and 4% Sauvignon Musque, and was fermented in 82% stainless steel and 18% French Oak. The wine was also 95% aged in neutral French oak for a total of 5 months. On the nose I get what us wine geeks affectionately like to refer to as "cat pee" as well as hints of citrus peel, tangerine, mineral, and a touch of yeast or lees. It also carries a touch of white blossom aromas which I believe stems from the use of the musque clone. I'm excited to try this bottle. I had a bottle of Cakebread a few months ago and loved it.